Site 8 is on private land and is not very photogenic, so here is a fine example of a ringfort from Streedagh, about 15 km to the north. No. 8 (Caltragh or sepulchral rath), further to the northeast, and west of the road. "This circle is 90 feet in diameter, and is most probably sepulchral, though it has somewhat the appearance of a fort, or raheen, the surrounding stones being nearly buried in a clay bank There are no remains of a cromleac in it." - Petrie. "One side has been nearly all removed." - Wood-Martin. Petrie calls this a "Fort, or Raheen." 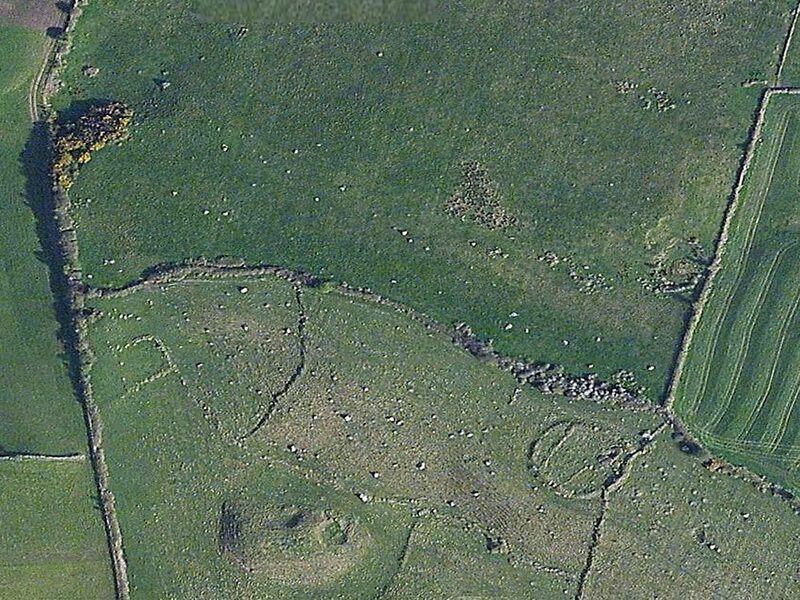 It is a monument of the same kind as the so-called Cealluras, Keels, and Killeens of other parts, but the fact that it is surrounded by stones nearly buried in the bank seems to mark it as transitional between the stone-circle and the earthen enclosure. "A peasant in the neighbourhood stated that in his youth old people used to recount how, on certain nights in the year, lights were to be seen in this 'ould fort,' and noises heard as if contending armies were engaged in fray. 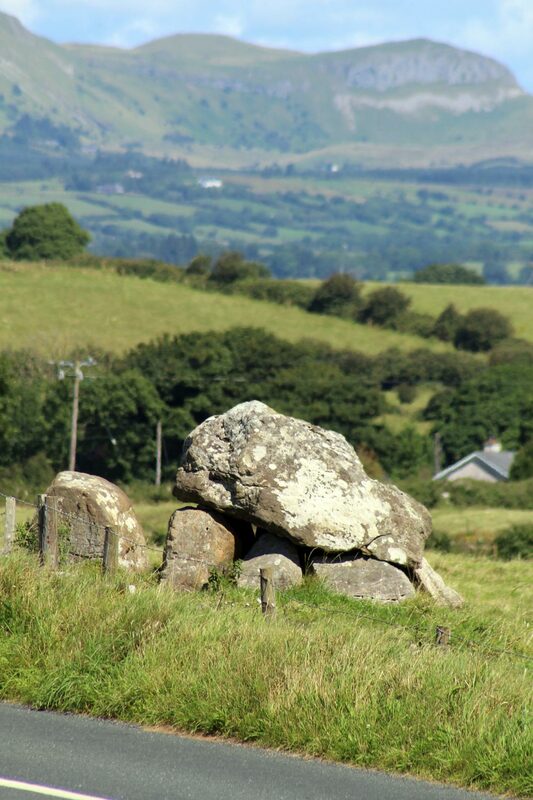 This legend is by no means peculiar to Carrowmore, but is to be met with in nearly every district in Ireland." I discovered a very remarkable instance of its existence in Cornwall. Lights were said to come out of a great pile of stones on the summit of the cliff at Ballowal, over Cape Cornwall, and to dance around it. This pile was apparently composed merely of mine refuse; but, on excavating it (being led to make trial of it by the legend), I found this only to be a surface-coating, and the whole of the interior to be occupied by a vast sepulchral cairn, containing a dolmen, stone cists, and a double-walled dome. So constant had been the tradition of fairy-lights coming out of it that people of the elder generation were afraid to pass it at night. The large ringfort at the south edge of Carrowmore. In Ireland the "little people" of two neighbouring forts or lioses were said to quarrel. Their battles took place by night, and the name Lisnascragh, or Fort of Screeching - given to several forts (according to Mr. Joyce), in the North of Ireland, was said to be derived from the noises they made. From the candles shining in them the names of some of these places, namely, Lisnagannell and Lisnagunnell, were popularly, but erroneously, derived. In Japan, the battles of the Kami*, or ancestral spirits, otherwise called Shinto, the exact parallels of the Lappish Sitte, the Irish Sidhe, and the Norse Elves, are said to take place with great noise in the air, and the stone arrow-heads found on the sea-shore after a storm are said to be those discharged in the conflict. Col. Wood-Martin is inclined to regard monuments of the class of No. 8 as the ferta of the medieval books, and a passage in the Book Armagh speaks of "the circular ditch, like to a fert, in which the Scottish people and Gentiles used to bury their dead," as equivalent to what the Christian Irish called a "Releg" (Lat. reliquae), which was certainly, in some cases, an enclosure round a cemetery, as at Glendalough, in Wicklow. 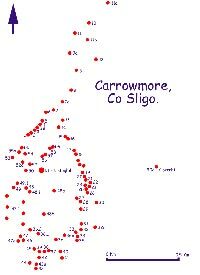 I should be more inclined, however, to regard a "fert" as one of those smaller earthen rings, some 10 feet in internal diameter, which are to be found plentifully in many parts of Ireland, and examples of which occur between Carrowmore and Knocknarea. They are held in great reverence by the peasantry, supposed to be sepulchral, and are never disturbed. *This word Kanzi is, I think, connected with the Bear and the worship of that animal among almost all the peoples bordering on the Arctic Ocean. It would have reached Japan through the Ainos of Yesso from the Kamscadal promontory, where the word actually means "bear". There is evidence of the worship of the Bear among the Lapps and Finns of Northern Scandinavia and Finland. Both these people called themselves Samelat, or, more correctly, Suomalaiset, i.e. Suoma-men. Now, among the Samoyedes, whose language is regarded as a classic type of Finno-Ugric speech, Szlom, or som, is a "bear," so that Suoma-men would be "Bearmen," and Othere was probably only translating for Alfred the name of the natives for themselves when he spoke of the Biormas, or "Bear-men," who dwelt on the White Sea. A great festival to the Bear-god was held annually by nearly every nation of the North, accompanied by rites connected with the worship of ancestral spirits. In Ireland the festival Samhain was the counterpart of this, as far as the worship of the Sidhe or ancestral spirits went, and, considering the many points of similarity between Finnic and Irish folk-lore, and the brachycephic skulls found in Irish tumuli, I am inclined to think that a Finnic element once existed in Ireland, and that in the name Samhain we have no mere "end of summer," as the word has been explained, but a survival of the same cultures of the Finno-Ugric peoples. The large ringfort at the south side of Carrowmore. There are said to have been several circles here, now destroyed. All the sites at Carrowmore have fine views of Knocknarea.